The iconic whisky distillery Ardbeg – which has won the coveted World Whisky of the Year title two years running – announces today (Tuesday 1st September) the launch of Ardbeg Corryvreckan - a whisky inspired by the famous Corryvreckan whirlpool. Corryvreckan is Europe’s largest, and the world’s second largest whirlpool. It lies near Jura and Islay, Ardbeg’s island home. Considered by the Royal Navy as one of the most dangerous stretches of water in the British Isles, the Corryvreckan whirlpool can be heard from a distance of 10 miles. The whirlpool’s raw, magnetic power exactly mirrors Ardbeg - the peatiest, smokiest and most complex of all the Islay whiskies. Dr Bill Lumsden, Head of Distilling and Whisky Creation, explained: “Like the whirlpool, Ardbeg Corryvreckan is heady, intense and powerful. Its ‘finish’ is long and deep, leaving the connoisseur with a lingering thought of a mysterious and daring journey. 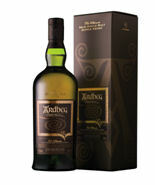 Ardbeg Corryvreckan will be available from 21st September at a price of around £60 (pounds sterling) in shops and online at www.Ardbeg.com. Bottled at a strength of 57.1% ABV and non chill-filtered, to impart full body and texture, Ardbeg Corryvreckan is the epitome of what Ardbeg stands for: “the untamed spirit of Islay”. Swirl the glass and dip your nose into torrents of tarry ropes and creosote. As you succumb to its power, a collision of waxy dark chocolate, blackcurrants and muscovado sugar, followed by a burst of plump cherries and earthy pine needles. With water, cayenne peppered steak surfaces with smoky bacon, cloves and blueberries. A heady force of treacle, menthol and chilli sauce. Taste: The first plunge is deep, peppery and chewy with crispy seaweed. As you descend deeper, a mouthful of espresso coffee that coats the palate with rich melted dark fruits (blackcurrants, blueberries and cherries) and star anise.